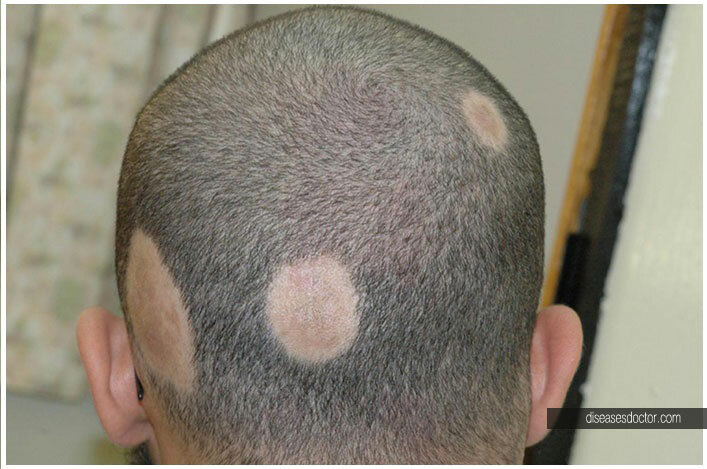 Alopecia areata is a medical condition that causes hair to fall out in patches. It is an auto-immune condition where the body's own immune system attacks its own hair follicles. It can affect all age groups, children with localised disease have a better outcome. It generally affects the scalp,beard area, eyebrows and rarely the body hair. There is no known cause for alopecia areata but stress can be an important trigger. It can be limited to 1 to 3 patches and be stable or continue to be progressive to form multiple patches. Sometimes, the entire scalp hair can be lost also known as Alopecia Totalis. There is also a rare condition where the entire body hair is lost (baring the underarm and pubic hair) which is called Alopecia Universalis. Being an auto-immune condition, the affected person may have other auto-immune diseases like auto-immune thyroiditis, Rheumatoid arthritis,Type I diabetes, vitiligo, sickle cell anemia, etc. The treatment is aimed at regaining the lost hair and stabilise the progression of the disease. The best treatment for regaining lost hair in stable patches is taking injections of immune modulators in the bald patch. These injections are repeated every 3 weeks and one may need 4 to 10 injections to see the results. Also, there are creams available that can initiate hair regrowth, albeit slowly. For progressive conditions, oral medicines are required. For Universalis alopecia, hospital admission and high doses of intravenous medicines may be required after thorough investigations.